With Christmas fast approaching, there was something five of our staff were getting excited about: a conference! 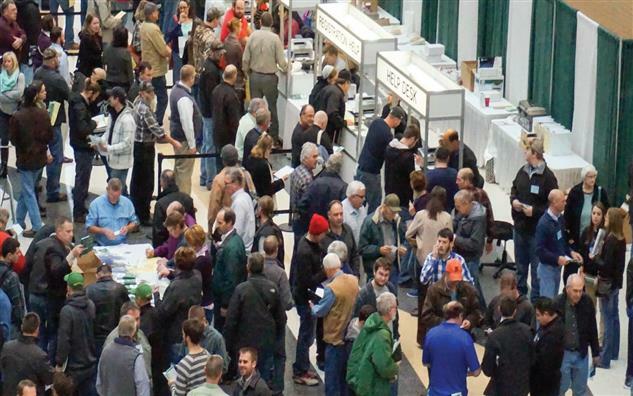 Every two years in Manchester, NH, the New England Vegetable and Fruit Conference (NEVFC) attracts several hundred farmers and farmer-friendly researchers. We made the laugh-filled trip to our destination and once there, met-up with other Maritimers for eats and drinks. We compared stories on escaping the first ice storm of the season back home, and exchanged notes on which conference streams we were planning on attending. This conference is a tight ship. Sessions are only half an hour long and are organized back to back, so speakers are generally pithy. And rooms are crowded – with usually a few of the more young and flexible attendees happy to sit on the floor – so having a bit of a game plan helps. Here were some of the highlights for us, in no particular order. Variety! There are people from many different backgrounds and demographics here, and the session themes are very diverse accordingly. Worldwide demand for Hard Apple Cider is booming much faster than is the production of cider apples. On the one hand, quality cider makers are excited at this demand, and all the room there is for innovation and growth. At the same time, some producers are pushing the envelop with lower quality ciders, which may in the long run hurt the public perception of cider as a drink category. U.K. presenter Neil MacDonald offered an engaging global cider market perspective. Research on optimal Honey Crisp Storage conditions is ongoing. Many researchers are still trying to find the ideal temperature, humidity, pressure and atmospheric conditions for this high-value apple. It was neat to discover a company at the Trade Show, Janny MTCA, that manufactures produce bins equipped with lids that have passive permeation membranes, allowing them to act as small-scale inexpensive ‘controlled atmosphere’ storage facilities. Very exciting for small quantities of high-value fruits and vegetables. We are tempted to order a two-row automatic seeder. This would allow us to increase vegetable production. Leaving weeds under grape vines can actually improve the taste of the wine by ‘stressing’ the plants. This conference is held every two years. In the meantime, we have a lot of work ahead of us if we are to accomplish even a fraction of all the ideas we have returned with!